Sold by PLEXSUPPLY and Fulfilled by Amazon. Gift-wrap available. Sold by PLEXSUPPLY and ships from Amazon Fulfillment. Intense, bright-writing colors inspire you to add depth and detail to your sketches, hand lettering, and journaling. 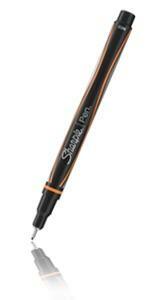 Be bold in your creative endeavors with Sharpie Brush Tip Art Pens. 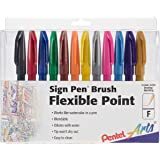 The versatility and flexibility of these brush tip pens elevate the art of pros, amateurs, and general artsy types no matter the project—from perfecting sketches to creating intricate hand lettering and journaling. 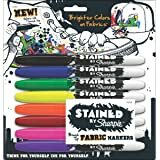 Vivid, bright-writing ink lets you push the boundaries of your art, while a quick-drying formula that is smear, fade, and water resistant means your work lasts. 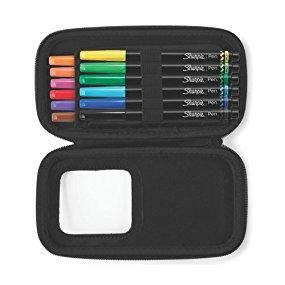 And, because inspiration can strike at any moment, a portable zip case keeps your art pens by your side. 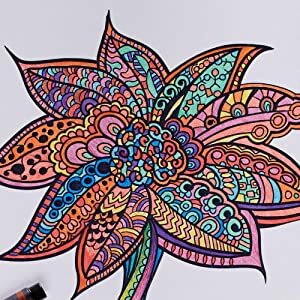 Ignite your creative spark with the brush pen that inspires wild, colorful art. Write, draw, and color in eye-catching shades. 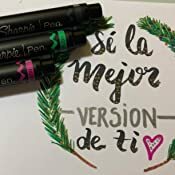 Sharpie Brush Tip Pens make each project bright, bold, and brilliant. Say goodbye to messy hands and smudged projects. 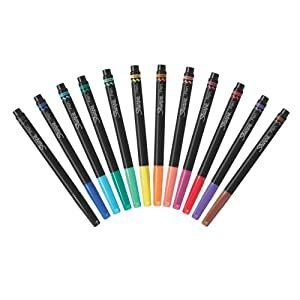 All colors write brightly in quick-drying ink that is smear, fade, and water resistant. The reusable, soft-shelled zip case is perfect for practical storage and fast access. 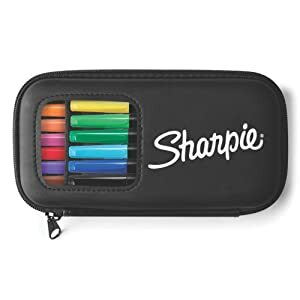 Its small, portable size is ideal for on-the-go creativity. 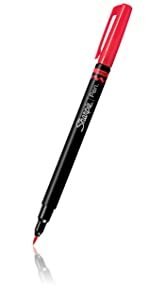 Create thin lines and bold marks in one stroke with the flexible brush tip that bends as you work. 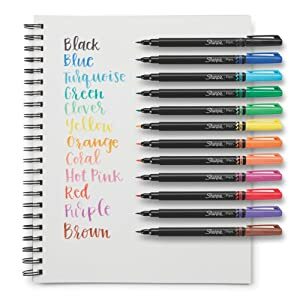 With bold, no-smear color, these brilliant art pens are ideal for hand lettering, journaling, sketching, and other creative projects. 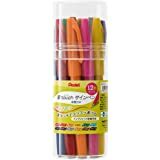 This set includes black, blue, turquoise, green, clover, yellow, orange, coral, hot pink, red, purple, and brown art pens. 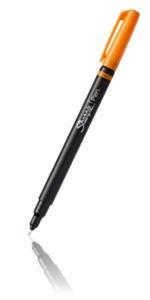 The brush pen that elevates the art form. 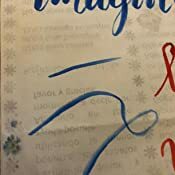 Bright-writing ink empowers you to picture it, sketch it, add color and push your creative limits until perfection strikes. 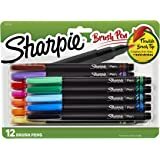 Featuring a bold palette of vibrant colors, a smooth brush tip for incredible flexibility and quick-drying ink that resists smearing and fading, Sharpie brush tip pens elevate the art of pros, amateurs and general artsy types alike. 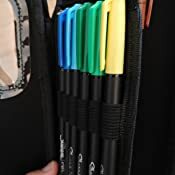 And the portable zip case means that when inspiration strikes, the art pens are by your side, organized and ready to bring your vision to life. 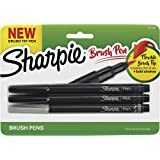 Nobody gets the artistic process like Sharpie and nothing can help you perfect your sketches, hand lettering and journaling like the Sharpie brush pen. 1.0 out of 5 starsDry right out of the package! The colors are beautiful. But, you can't even write a whole word before the tip is dry and scratchy. If left for a while the tip will get ink again. I really don't want to write 1 stroke for a letter, wait 2 minutes and write a second. It would take 10 minutes to wrote a name. Not fun and inhibits creativity to always be waiting for the pen to be ready. That is just for the colors that worked right out of the box. The pale sea green color didn't even work. It was completely dry and no waiting around did anything for it. 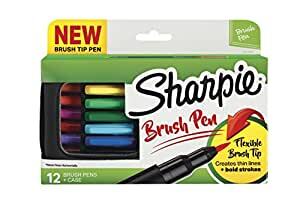 Big disappointment from Sharpie. Usually their markers and pens are on point. 1.0 out of 5 starsHardly any ink! 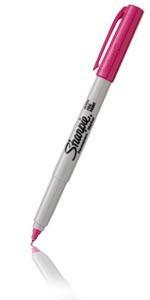 I love Sharpie products. 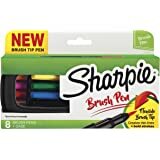 The brush tips are fantastic. It’s easy to make super thick lines and super thin lines. I bought one or two from a local store and then I bought the whole set on Amazon. All of them only had enough ink for 2 words. Literally. 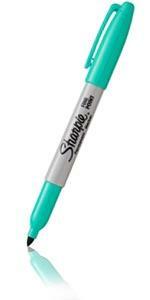 I wrote my name and then I wrote the color of the pen and all of them barely had enough ink for the color word. Very disappointed in Sharpie. 5.0 out of 5 starsPerfect stiffness to these brush tips! 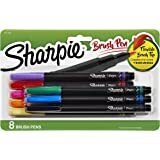 I use these for brush calligraphy and they are perfect for me. 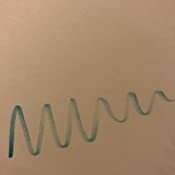 I am left-handed and I find that most of the advertised brush pens/markers that people use for brush calligraphy are to "squishy" for me because of how I have to write being left-handed. But THESE are great because they have just enough "stiffness" to them that I can get my thicks and (especially) my thins just right even though I have to push instead of pull for my thin lines. Love 'em! 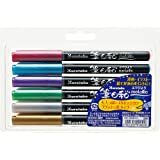 5.0 out of 5 starsLove these markers! 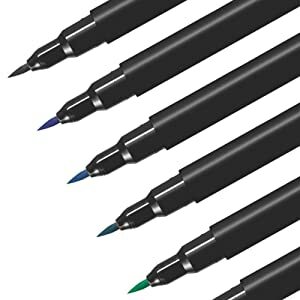 Expensive and has nothing over the bargain type brush markers. 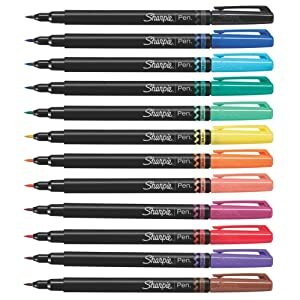 I love these pens. Great brush tip. Flexible yet returns to original shape. I wish there were more colors!! They have not dried out on me, but I am not using them excessively. 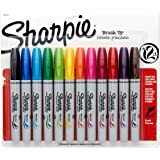 I love all things thin tipped sharpie pens at work, at home and at play. Having the complimentary brush pens that make the thin tips was a welcomed addition to my beginner art hobby. 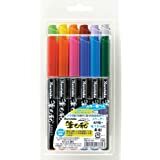 Make more colors!! !